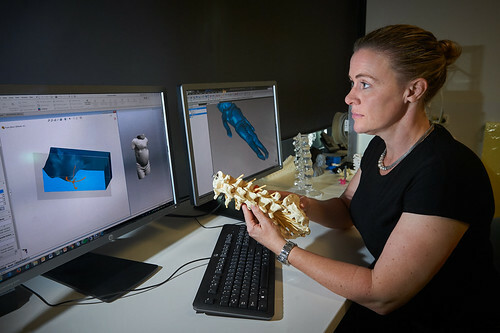 When 10-year-old Chelsy Jones needed a lengthy operation to correct a spinal deformity, her surgeon enlisted the help of QUT biomedical engineer, Dr Paige Little, to custom design a novel support mattress. Dr Paige Little, from QUT Institute of Health and Biomedical Innovation, said Chelsy’s unique body shape meant she could not safely lie flat on her stomach on an operating table for the 8-hour operation she needed. Chelsy’s orthopaedic surgeon, Dr Geoffrey Askin, asked Dr Little, a member of the Biomechanics & Spine Research Group based at the Centre for Children’s Health Research, if she could design a support mattress to fit Chelsy’s upper body. “When lying for a long time in one position, such as during a lengthy operation, a patient needs to be protected from high pressure on the skin and underlying muscles that could cause damage," Dr Little said. “Chelsy’s unique anatomy called for something specially made to relieve pressure on her skin during the surgery. “Without a special support, Chelsy would not have been able to undergo the operation on her back, which was vital for her to maintain mobility. 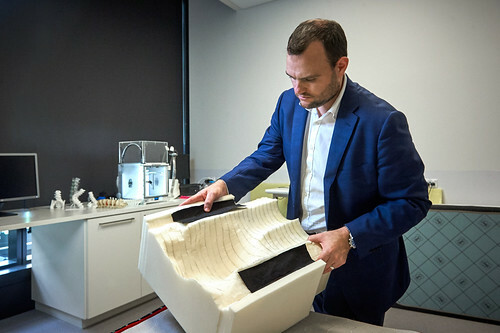 “We have been working with our industry partner, mattress manufacturer Sealy of Australia, on research using 3D surface scanning and MRI to investigate spine alignment and the distribution of body weight on firm and soft mattresses for more than a year. Dr Little said the first step of the process was to take a 3D surface scan of Chelsy’s body, which was then used to produce a 3D computer model of her body shape. “This body shape became the 3D mould for the mattress surface and was given to Sealy to manufacture a firm foam support mattress,” she said. Chelsy’s mother, Nicole Winter, said it was the second spinal surgery her bright and brave daughter had had, but this one was much longer than the first. “Chelsy had the surgery to decompress and fuse parts of her spine – mainly her whole spine was done,” Ms Winter said. Sealy of Australia R&D manager Daniel Green said the company was only too pleased to assist with clinical support and to make a difference where they could. Dr Little said other surgical teams had inquired about having custom-made supports for their patients undergoing surgery that can be up to 12 hours long.